but its in the pipe line. can e-mail me personally if you wish m0sgb@yahoo.co.uk or reply on here. Excuse me for being ignorant Steve, but what’s a geo-cacher? Google is your friend (apparently). A kind of modern treasurehunting, interesting. Orienteering for those who walk rather than run. It makes a good aside to SOTA as there are Geocaches either on or near a lot of SOTA summits in the UK and no doubt in other parts of the world too, plus those that can be visited on route to summits. It is a great way for those new to using a GPS to get used to using them before venturing into the wilds. It also keeps my children busy while Helen and I play radio on the summits, although usually we have to help them out to actually find the cache. I remember back in 1993 we walked on Dartmoor and found a box with a logbook, a stamp, and different other things in it. The hotelowner told us that walkers tried to find those boxes and fill in the log and stamp their own log to prove they had been there. So this might have been geo-caching pre GPS then? 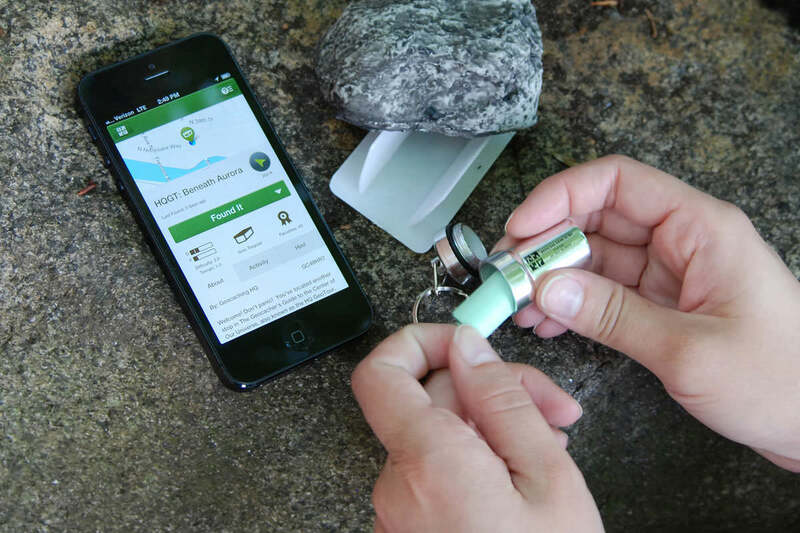 geo-caching/sota-caching sounds like good fun and can be combined with sota activations. I am about to get into geo/sota-caching myself, as soon as I can figure my way around my Garmin Venture CX. You need a college degree just to switch it on, hi. Until now, I mainly use it to guarantee I’m within the 25 metre height rule for summits, but have been promised “driving” lessons by Helen GW7AAU. Thank goodness Helen’s other half, Steve GW7AAV didn’t offer, because for him, all roads lead to Birmingham, hi. The vertical accuracy is significantly worse than the horizontal accuracy for GPS systems so they are not so useful for determining your precise height. It is more reliable to transfer the GPS position onto a suitable map and read the surveyed height there (at least in the UK where mapping is excellent). The Etrex Summit is better for this purpose. It has a barometric altimeter and autocalibration. I recently looked at Knockboy in Ireland, which is a double humped summit, and found it the Summit very good. As it happens both humps are obviously in the activation area so it was an academic exercise. I fully agree that a non barometric GPS is not the instrument to use to determine if you are in the activation area without reference to the map position. While on the subject of GPS, I find the most interesting use is downloading and examining the track on Memory Map when I get home. I have tracks for most of my recent - last year or so - expeditions. It could be useful when returning to some MW summits where OS mapping of paths is at best mediocre !! One going up to Scotland the other going to Bristol, And one going to York. Will e-mail you soon with details many thanks. I have been reading on your site and others and this is very challenging and interesting. As my wife and I are both keen walkers (my wife loves nordic walking) we might have a go at it ourselves. I have been doing my home work on this area where I live and will be out tomorrow doing two just up the road from me. I was on SKYPE with Steve for around 2hrs today getting clued up on what to do and I find it most interesting and the thing is you can do it on the way to the summits or on the way back. So looks like another hobby to do I don’t know where I found time to go to work hi. Rumour has it that anyone finding one of yours is required to leave a £50 note and then phone you to let you know within the hour. P.S. Never found one myself, but was accosted by two of your geo-cache followers on my ascent of Cyrn Y Brain who marvelled at meeting a real live SOTA Activator! I found a geocache once and I don’t have a GPS! It must be trivial if you have a GPS to tell you where to look! Looks like you and the wife will be the next cachers. hi hi. Well as I said I did do the Park Life one and took me about 10-15mins to find it,it was in a good spot but it was a bit muddy under foot as the river had been in flood. And never got to the other as got draged into the club by the neck as I went by hi but will do that tomorow as WX is gooing to be better over here. I had to sit and read the Etrex Vista hand book before I went out that,long since I uesed it,I also have another Etrex so will have to dig it out. Will look for a good spot on TW-004 to place a cache like you say but been a tadpole will have to do that later hi.